Hey guys, let's talk charity. Wait, don't close the browser tab just now, there's amazing stuff to be won. In a collaboration of greatness the Oldhammer community and Collecting Citadel Miniatures have set up a charity project to raise money for UNICEF. The Oldhammer movement of course has been around for quite a few years and is a community which is rather close to my heart. Rather than just enjoying and sharing old GW figures and books the whole idea is to propagate a way of playing fantasy and sci-fi miniature wargames in a style which does not submit to the 'hamster wheel' of the latest release or the current metagame of what is perceived as strong or weak. Which is a kind of gaming I can subscribe to (I actually bought the t-shirt too). It boils down to the usual thing: Play what you enjoy. If people don't like the way their wargames are taken by the publishing company just play the incarnation you enjoy. If of course you enjoy the games are they are that's great too. No need to fix what's not broken. 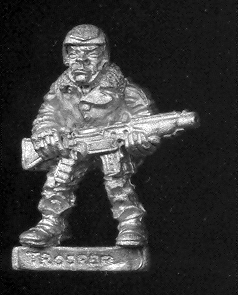 Collecting Citadel Miniatures is an immensely handy wiki-style website which works as an archive of past GW models. Over the past many years I used it a lot to identify miniatures and just browse. The charity project is called Project Alchemy ('turning old lead into gold for charity') and already you can view some of the amazing prizes which are going to be raffled away in September on their site. They include such gems are unreleased GW figures, resin production masters, original artwork, signed publications and even cufflinks and there is more to come. The model of course sprung from the talented hands of Mr.Bob Olley. So watch this space for updates on this project and make sure to jump in on the occasion. Donating is done via Project Alchemy's Just Giving page (if I remember correctly donating via Just Giving is even tax deductable in the UK) and is going to UNICEF, so nothing dodgy going on. Every little bit helps.